A beginner's set has everything you need to get started. Too often, golfers decide to buy new golf clubs without giving thought to the various aspects of them that will help or hurt their games. Instead, they settle on clubs that may impress their golfing buddies but do nothing to improve their performance. Before you make that trip to the sporting goods store or to the pro shop, or your purchase them online, do your homework. There are a lot of ways that your new clubs will have you shoot lower scores and improve your love of the game. Decide between shafts made of graphite or steel. Graphite shafts are more expensive but they are lighter, so you will swing the clubs with a greater speed that will increase your distance, particularly if you are a novice or you have a slower-than-average swing speed. If you are a more accomplished player, perhaps steel shafts are the more appropriate choice because you probably have a quicker swing speed and the clubs will help you be more accurate. Besides, better players value the greater “feel” of steel shafts than those of shafts made of graphite. Choose among five different flexs of shafts, regardless of whether they are made of steel or graphite. Flex is how much a shaft will bend when it is swung. Your choice of flex range from ladies with the most "bend-ability" to extra-stiff shafts that hardly bend at all. Your best bet is to consult with a professional club fitter who has the machine to determine your clubhead speed, the primary factor in choosing the correct shafts. If you don't have access to one, base your selection on how far the ball goes when you hit it with a driver. Pick a clubhead made of steel or titanium, or a combination of both metals. Titanium clubheads are considerably more expensive than steel, are as strong steel clubheads, but yet are lighter. Since they have less weight, the drivers' clubheads can be larger so they have a larger surface on their faces, thus making it more difficult to mishit shots. A combination of graphite shafts and titanium heads are a terrific choices for golfers whose game needs improvement because those clubs are easier with which to hit. Determine the combination of metal woods, hybrid clubs, irons and wedges that make the most sense for your game as long as you limit you choice to 14 clubs, including a putter. Many players choose to give up their long irons in favor of hybrids since they are a combination of irons and woods and are easier to hit with. Then, instead of only the two wedges that were available in the past, a pitching wedge and a sand wedge, you now must consider a gap wedge and a lob wedge. If you are unfamiliar with these clubs, talk with your golf professional about how they are used. 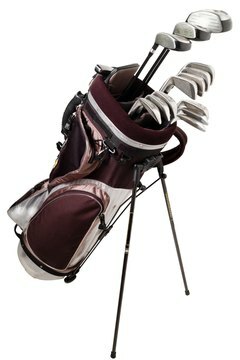 What Golf Clubs Are Right for Me?